I took a couple days off work during my mama’s Easter break and the two of us went down to New Orleans! I feel kind of silly because the whole time I was there I was like, OOH I need to post about this! But I didn’t really have a lot of time on the interwebs so that didn’t so much happened. And now I’m like, oh, umm, I guess posting about my cab ride on the way to the airport isn’t that exciting anyway, is it? 1) There was something I was going to put in #1 and then I got distracted! 2) PARADES. We went to three parades, and only one was on purpose! I don’t think my mom has ever been in New Orleans for a parade-oriented holiday, unless it was when I was really little and we were visiting my dad (he worked in New Orleans for a while when I was, like, two. I remember almost nothing of visiting except for the time my mother accidentally left me on an elevator, except for the eerie flash when I’m looking at something that looks strangely familiar). Anyway, the upshot was that she was super excited and a little girl we know back here in NY is getting a LOT of shiny beads. Yeah, my mom arranged them on the hotel bed when I wasn’t there. Watch the video. No, seriously. 3) I finally got all the split ends cut off my hair! Doing so cost less than a third of the discount price at Bumble & Bumble where the split ends were NOT cut off. 4) Green Goddess is ALWAYS one of my favorite things, and we ended up there every night that they were open from the time we landed. We were planning on going over Saturday, but then our flight got in an hour early and my mom wanted a drink, so I was like HEY I KNOW HOW TO FIX THIS. Chef Chris is one of the awesomest chefs I know and you should go and eat his food. Scotty is not only the awesomest bartender but one of the awesomest people I have the pleasure of knowing and all of you should go and have him make you drinks. When we came back on Saturday, I sat at the bar so we could chat (which mostly involves geeking out about liquor), and I told him about the Easter Peep Cocktail Tradition (God, that last one is the first one I did, and it was really pretty but kind of awful. There’s no picture of the third and probably best of the drinks, which was a rum and chocolate liqueur concoction with a chocolate peep in it, but I think that is from the Era of No Camera). And he told me that if I brought over Peeps the next day, he would make me one! Like I said, AWESOME. It has Miller’s Gin, Crism Hibiscus, and Mandarine Napoleon in it, and it was super delicious. They also had a TEMPERANCE HATCHET. I kind of took enough pictures of the displays in this place for a whole other post because I am that kind of nerd. The only problem with last weekend is that it is over. The drinks you invent always make me think of Cure. I'm glad you got there. It was so exciting! I could have just sat there and stared for hours. And my mom is going to let me rip out the spare room in her house and turn it into a bar, and now I have so many ideas of how to organize! I wanted to bring you some liqueur but I ran out of bottles so Scotty got the liqueur and you guys got maple syrup from our trees! I hope you enjoy it! Next time I come, I will be better organized and bring honey. Oh, cool! I'm not even sure if I can drink on Wellbutrin (I haven't tried yet), so the maple syrup is great. Thanks! You are welcome! Poke Chris about it if he hasn't given it to you yet! P.S. Not really, as it's for one of our cats and he needs it. But you have to admit it's an intriguing idea. Hey, it's me! I will try turning *anything* into a cocktail, given the proper inspiration. My next experiment is going to be hops-infused liqueur, and I'm going to pick some of these amazing violets in the yard and make my own creme de violette. I tried to take you to Cure but they were closed! I think they had limited hours for anything that counts as a major New Orleans holiday. One of my favorite things about the city was that on many weekends you can basically set out walking in any direction and eventually find a parade and/or street festival. OH! Okay, then you are forgiven. I like to call Cure a post-modern temple of liquor. I'm not sure if I said that to you the other night, but I do mark that churchiness a good thing. Is churchiness a word? What decent barman wouldn't want to add a peep cocktail to his repertoire? I don't think you did, but postmodern temple of liquor is a very good description. It engenders that whole meditative-reflective-grandeur sort of feeling. And churchiness is a word! In the dictionary! I just looked it up! 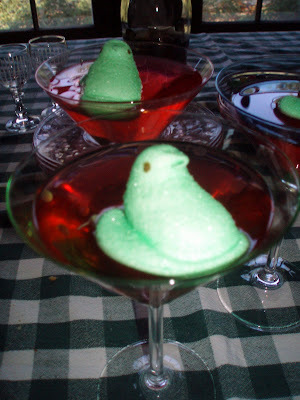 You are the first person to make a peep cocktail FOR me! It's always me making them for other people! I don't know if that means you get a prize or something. I find the bear EXTREMELY creepy. And it now lives in my apartment.